EDIT: They came out with more colors! Check my swatches here (April 2016) and here (October 2016). I’m always on the look out for lippies with awesome staying power. I, for one, am a very busy lady and I don’t have time to retouch my lipstick every hour or so. 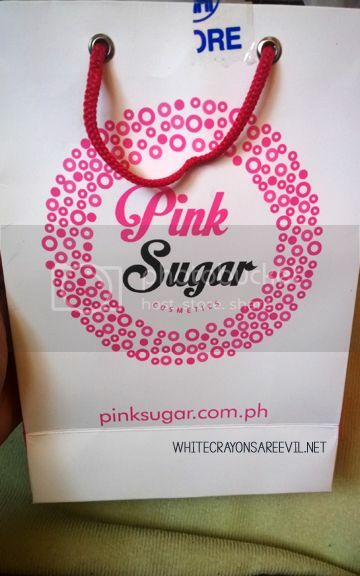 L, our office’s newest resident beauty and skin care expert suggested that I try Sugar Tint Lip and Cheek Tint (retails at Php 349 each). Lucky for me, they are in SM Manila – one jeepney ride away from my house. Anyway, I took the time to do some swatching since no one was literally at the stall to bother me. The Sugar Tint line has five shades; I don’t know what they’re called since there’s no name, not even a number on the actual container. Let’s call them (from the top): sa pagitan ng pink and violet, red-ish na bright, electrifying pink, deep violet, coral-but-not-really. 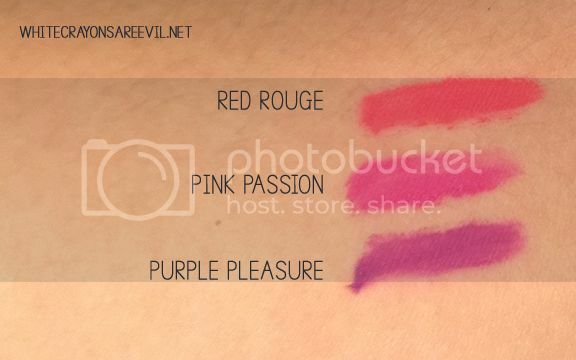 After catching a movie, I went back and decided to get myself the “electrifying pink” (Pink Passion), “deep violet” (Purple Pleasure) and “coral-but-not-really” (Red Rouge). Here they are, with their actual names. Look, the color of the box matches the color of the lippies! +1 for attention to details! The sales lady even gave me a cute little paper bag. She was kind enough to ask me if I want one, and of course I said yez plez. 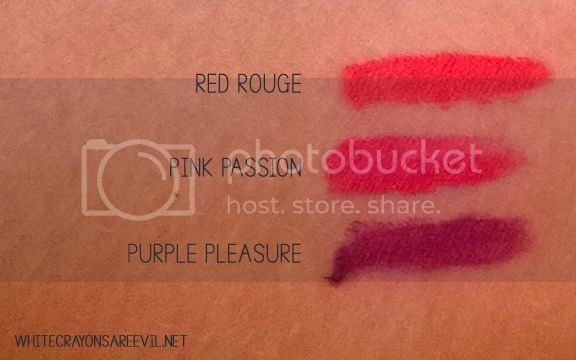 Red Rouge is my favorite of the three. 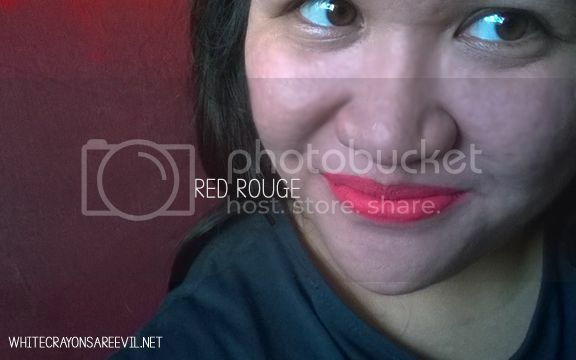 Well, pardon my selfie, but Red Rouge’s a tad bit darker than that, but it’s still brighter than most of my red lippies (and I have tons). Maybe it’s closest to the last swatch above. I guess it’s coral-y, but on the red side, rather than the orange. I love this shade because it matches my skin undertone very well. This is now my default lippie. I just looove it much. Pink Passion is a fun color, a good option if I’m in a mood for some pink. The color’s not super neon, so I could probably wear this for everyday use. 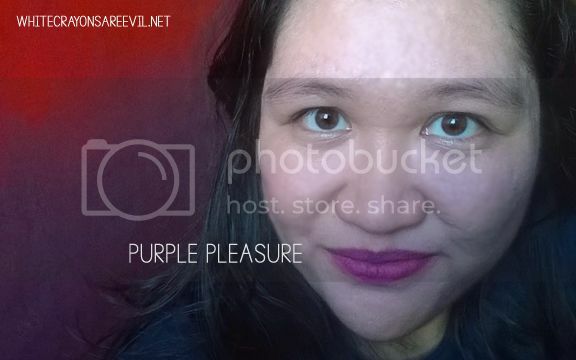 I had reservations if I should buy Purple Pleasure since I always believe that violet does not suit me. But look at that color! Vavavoom! The purple’s not on the darker side, but not neon-y neither. i simply love it, I love the color on my face. If i look weird with it, I’m just gonna pull it off with loads of self confidence. And now, the pros and cons. – It really is truly long-lasting. Color me impressed! I wore it in the morning and it would last until the evening. Not an exaggeration. – i LOVE that it leaves no to minimal stains on my coffee cup! 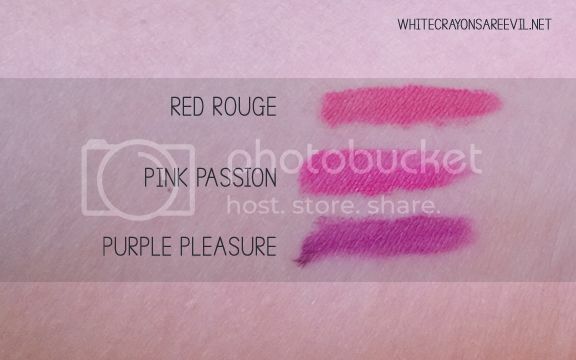 Also, unlike my other highly pigmented lippies, this does not stain my teeth! Lurve. – when you wear it, you’ll smell a berry-ish smell. Lurve. – it left my lips feeling kind of dry. It really depends though. I was out doing stuff outside the office one day and I didnt have the opportunity to drink any water for about six hours. The Sugar Tint stayed on. However, my lips looked really chapped. I read that you could wear balm before applying this. I have to try that. – also, it’s quite hard to remove, which I guess is a consequence of it being highly, HIGHLY long lasting. So yeah, those are my only cons. I absolutely LOVE everything else about these lippiebabies, except for the drying thing. PS. I don’t really like it as a cheek tint since it is highly pigmented and too much cheek color is not my thang. 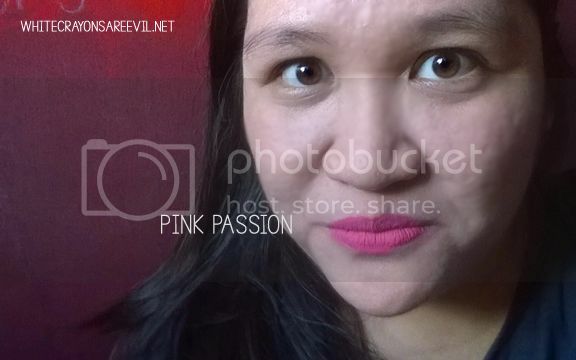 I went back to SM Manila to try Pink Sugar’s HD and matte lipsticks. AGAIN, there was no saleslady at the stall. I was in a hurry so I didnt wait. I ended up buying another Maybelline Velvet Matte. Because, sale. Someone stop me from this obsessioooon!!!! Girl I love your honesty and un-retouched pics! It really helps people like me who mostly shop online.